Sony has announced the UK availability of its DR-BT100CX and DR-BT101 Bluetooth headphones. The pair first broke cover at this year's CES show in January, wowing audiences with their noise-cancellation capabilities and the fact that they do away with wires, preferring Bluetooth connectivity. The in-ear DR-BT100CX feature USB charging, eight hours' playback and are billed as lightweight. The DR-BT101 range is the meatier of the two. Touted as a headband headset, these cans feature twelve hours of playback, a 30mm neodymium driver and are said to give off a rich, clear sound. Both sets feature finger-tip controls to adjust the volume, play and skip music tracks, and accept phone calls. 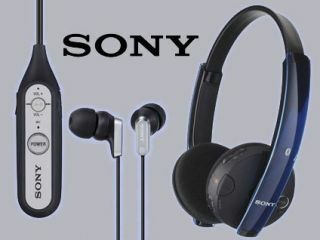 As with all of Sony's products, there's no official pricing but expect the headphones to appear on Sony's online shopping site sonystyle.co.uk imminently.